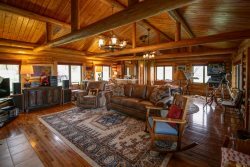 A warm and welcoming 5 bedroom home with private hot tub in Big Sky's Meadow Village is ready to be your mountain escape! This spacious 5 bedroom and 4.5 bathroom end unit sleeps 14 comfortably. Comfort awaits you, including a master suite with king bed, 2 upper level bedrooms 1 has a queen bed and the other 2 twin beds, main level bedroom with King bed and 2 twin beds, and lower level bedroom with 1 queen bed. The lower level also features a twin sofa-sleeper and twin futon. Relax after a day on the mountain in your own private hot tub or in front of the fireplace. Cook a delicious meal in the well-equipped kitchen stocked with a coffee maker, toaster, complete dish/glassware/silverware, stemware, and collection of pots and pans! Don't feel like staying in? Just 10-minute walk to Big Sky Town Center which offers numerous shops, restaurants, free concerts in the park, movie theaters, farmers market and much more. Continue on a short drive or free shuttle to Big Sky Resort for skiing, snowboarding, shopping, restaurants, hiking trails, mountain bike trails, lake, spa, and zip lining. The best part about this home? Its size and value! This home is setup to sleep a large family or two and you’re also just a short drive away from the town center and Big Sky Resort that has tons of fantastic shops, restaurants, and bars. Yellowstone National Park is a 50-minute drive away too, so there’s always something new to explore! - Outstanding location – 10-minute walk to Big Sky Town Center, and amazing mountain views! The pictures represent the house well, there was lots of space and it worked great for a crowd. The location was great for skiing, ten minutes from the slopes and parking at big sky is free and easy! Older house but great for large groups! Our stay at the Two Moons house during Christmas week was fantastic! Working with Lone Mountain Escapes to make this week happened was fantastic as well! We loved the location, easy 10 minute walk to the shuttle, shops, restaurants, theater and numerous art galleries. There is also an ice rink! Loved wandering around there. And coming around the corner on the street, on clear days, to see the mountain in the distance (everyone was skiing there at Big Sky) was just another spectacular site. The home was amazing, with so many bedrooms and bathrooms. All of them well stocked and ready for use. Loved the kitchen and the fact it was also well stocked with EVERYTHING one needed to get started on a meal after a full day of travel. Spices and oils and coffee and .... the list goes on. As we were there in the winter, and it snowed three days out of the seven, was pleasantly surprised to have the driveway plowed for us! That was a bonus. Getting around during snow was uncomplicated, as the area keeps the roads plowed amazing well (!). Finding the fireplace in the family room, meant we didn't move from there the entire week. Wood in the garage was an unexpected surprise. The house was beautifully decorated, felt warm and comfortable, had thoughtfully left chairs in the hallway to sit on to remove snow boats. A hot tub, exercise room, and lots of space to relax was great. The sauna in the basement was a surprise as well! And it can MOST DEFINITELY handle as many people as advertised. Everywhere we turned, there was another bed/bathroom accessible which was fantastic. All in all, want to give a warm thank you to the owners of Two Moons Road house as it is absolutely amazing, and one we would come back to when we are in the area.